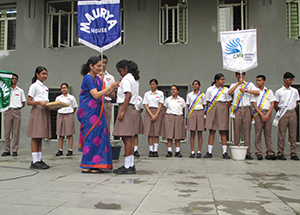 To inspire a healthy sense of competition, students of CMR National Public School have been allocated one of the four houses which symbolize the school’s values. Students develop a sense of belonging and a feeling of unity in being a part of a specific house. The four houses are named MAURYAS – Blue House, SATHAVAHANAS – Green House, HOYSALAS – Red House and RASHTRAKUTAS – Yellow House, after South Indian Dynasties which upheld values of courage, love, valour and intellect. Each house is led by the House Mistress for a year. The Captain and Vice-captain guide their teams on all fronts and play a vital role in leading their team to victory in all events. Participating in various inter-house competitions not only gives the students a chance to display their talent but also helps them learn valuable lessons on team work and selfless service. 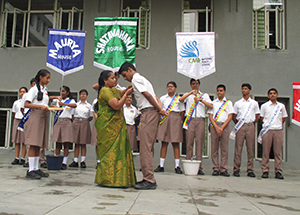 Be it a debate, quiz or sports event, students give their best to win laurels and house points. 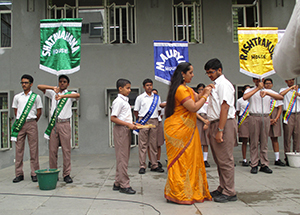 Participation in various activities brings the house honour and gives the students a sense of pride. Motto: Red Essential. Limitless Potential. Red is the symbol of love, courage, sacrifice, victory and honour. Students of Red House stand strong and united at all times. They are creative and highly talented and this is the secret of their success in various inter house competitions like Basketball, Debate, Face painting and Floral Rangoli. The Hoysalas are enthusiastic and achieve their goals, thereby upholding their values always. Students of Red house are known for their togetherness, and face adversities as a team. They are the jacks of all trades performing to the best of their abilities in sports and cultural events. The colour Green is indicative of elements like nature, fertility and life. It represents growth and harmony and is the colour of the environment. Green house is appropriately named ‘The Satavahana’, because of their link to the natural elements of the environment and are natural winners. The Satavahanas are always ready, rearing to go on and achieve always while keeping in mind their goals. The green signal always signifies movement. Students of the Green house are down to Earth, sociable and responsible. All the members are all- rounders and are consistently good performers in academics as well as sports. 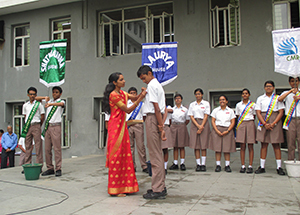 The students of the Blue House, referred to as Mauryas are known for their highly intellectual skills, stability and unity, symbolising the blue colour. The Blue House takes great pride in working for their ‘Kingdom’ and have emerged the winners of the much coveted cup for ‘Best House’, many a time. They are triumphant in many of the co-curricular activities, be it quizzing or sports. Their greatest asset is their confidence and determination. Students of the Blue house possess immense intellectual vitality. They are committed to their goals, and are all-rounders and achievers. Though known for intelligence, the Mauryans can summon immense courage in other fields as well, as duty calls. The Rashtrakutas, better known at CMR NPS as “YELLOW HOUSE” are a dynamic, determined and dashing race. Led by a belief that they are more than just “an ordinary group of students”, they truly stand out. Yellow being the colour of the Sun, they are a shining example to the students of the school. Every Rashtrakuta is proud indeed to be part of a house that shines with the qualities of perseverance, faith in one another and the ‘never give up’ attitude. Students of the Yellow house are usually described as impeccable, par excellent, dependable, radiant, exquisite and spectacular.